Facial recognition technology is coming to retail with the launch of Cara. Created by New York start-up IMRSV, Cara is real-world facial recognition software that turns a camera into a data collector to help retailers learn more about their customers’ attributes and actions. The technology can be used to help businesses attain and analyze real-time consumer data, as well as to help advertisers develop demographically based ads. Reebok and IPG are just a few of Cara’s customers and the technology is poised to redefine and refine the science of ad targeting. MediaPost.com took a closer look at Cara for a glimpse at the face of modern data collection. Cara works by detecting facial features to determine demographics like gender and age. The software is reported to have 92% accuracy in terms of demographic recognition. Once the consumer’s facial facts are collected, the data is sent in real-time to an online dashboard where it’s measured for three factors. The first is attention time, which is the amount of time a consumer spent looking in the direction of the camera. The second factor is duration, which is the amount of time the consumer spent in the location not looking at the camera. The final factor is glances, which is the number of times a consumer looked away from the camera before looking back. 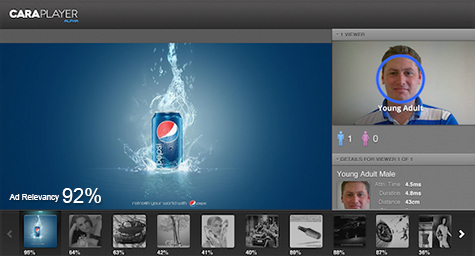 The software can also trigger ads or events based on the demographics of consumers in front of the camera. This allows stores to target different ads to different audiences in order to promote the products that suit their individual interests and needs. The result is more accurate, efficient, and intelligent ad targeting. According to IMRSV founder and CEO Jason Sosa, Cara is unique because it works across real-world environments with any ethnic group and lighting conditions. Since privacy is a priority to many, IMRSV has taken the necessary precautions to ensure consumer anonymity. Mr. Sosa explained that Cara only collects data on general demographics and attention time, but does not collect any personal information. He added that the software does not take pictures, record images, or operate in ways to make the consumer identifiable with any truly personal information. Cara is extremely new, but the data collected by the software already suggests that people look at an advertisement for less than one second in the real world. This puts pressure on creative teams to develop ads that instantly capture and compel audiences. While such insight may make their jobs much harder, it will only improve the quality and results of retail advertising. Looking forward, Cara has the potential to be used in grocery stores, malls, trade show booths, and many other real-world shopping locations. Even governments are showing an interest in facial recognition technology to improve urban planning, as well as automakers and toy companies that want to know more about their customers to better tailor their products. Cara facial recognition technology is currently available on Windows and Linux PCs, but the company plans to release it on Android and iOS by the end of the year. Uncover the latest advances in ad targeting. Contact MDG Advertising today at 561-338-7797 or visit mdgadvertising.com.